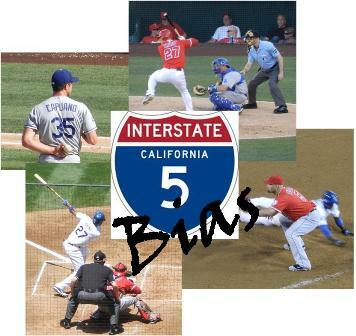 Welcome to I-5 Bias: the 2013 Season’s End Edition! This is the latest in what continues to be a fun, occasional, throughout the season collaboration between this Angels blogger and Matt Lowry of Dodger Familia Thoughts, a great Dodgers blogger and friend of this blog. Matt and I were originally inspired to start this column by the huge shift in attention the AL and NL West have enjoyed. Between tough competitions down to the October wire, prominent postseason performances and some pretty loud player acquisitions, the AL and NL West, and frequently my Angels and his Dodgers specifically, have been big, big news. So we thought that we would share our perspective on these two Freeway Series rivals, to entertain, inform and, hey, to spark conversation and debate. Why not! East Coast bias? No, forget that. From now on it’s I-5 bias instead! The Dodgers and the Angels both had abysmal starts to their seasons. But by the end of June, the Dodgers started to turn things completely around. What are your thoughts on the Dodgers comeback/why do you think they were able to turn their season around? Matt says: It’s amazing to think about what the Dodgers did. At the begining a lot of things were going completely wrong. Injuries, Leaving runners on base, Errors, Mismanagement, I mean whatever you thought of it happened with the Dodgers. When they went on that run It was unbelieveable run and took first place, There was a feeling that this team could do something special. How they were able to turn it around? Honestly there was a number of things. Everyone started to trust one another, In an Interview before the Blue Jays Series Adrian Gonzalez and AJ Ellis said that everyone on that team started to trust each other. Taking a few pitches and not over do things knowing the next guy behing them. Anotheher was the pitching started to get better. If you look at the Dodgers Statisiticly pitching it started with their top two starting pitchers in Zack Greinke and Clayton Kershaw. In the 2nd half both are a world better with low ERA’s and great win-loss records so there was no doubt that they would get it together. The rest of the staff on the other hand really went on to shock me. Ricky Nolasco was really getting it together, Hyun Jin Ryu continued his success, and the Bullpen as a whole managed to get better and the addition of Brian Wilson made it better as well. Let’s also not forget about Yasiel Puig! I think he was the huge spark that the Dodgers needed with his play. And what are your thoughts on the Angels continually frustrating season/why do you think they weren’t able to turn their season around? Kristen says: Frustrating doesn’t even begin to cover it. Trust me, I watched something like 145 of 162. Seriously. There are a lot of things that went wrong – injuries, veterans failing to perform, an on again/off again offense – but I think that the worst thing, the truly irreparable nail in the coffin, was pitching. This is a team that had relied on stellar pitching for the last string of seasons and they went into 2013 without a true starting rotation and no improvements to speak of in a shaky bullpen. Then injuries and aging arms made the pitching situation even worse and the powers that be failed to make any moves that constituted so much as a legitimate patch before the trade deadline – not that they really had a lot of funds to make such a thing possible by that point in the season. Matt says: The Angels were a team I thought would also get it together in the 2nd half of the season. They had the offensive fire power, Pujols, Trout, and Kendrick was doing their thing, Josh Hamilton was starting to come around but ultimately the Angels couldn’t get it done. You had the injury to Albert that put himout for the rest of the season and inconsistant play it just wasn’t good all around. I think what hurt the Angels was the inconsistant ball play. The inability to really put something together to make a run hurt them. In the AL West you can’t afford to lose series against the A’s and Rangers and expect to make up ground. Droping games against Seattle and Houston didn’t help at all either. I believe the Angels needed to get it together consistantly and didn’t. With postseason baseball coming for the Dodgers what is their biggest strength and weakness? How far do you think they can go? Matt says: Their biggest strength will be pitching. I always preach that pitching will win you championships. Look at the Giants in 2010-2012 and look at the Phillies 2008-2009. Both had a great pitching staff that lifted them to World Series appaerances/Championships. That’s what the Dodgers needed and they tackled it well the Dodgers pitching staff is getting it done at the right time and when it’s really needed. Kershaw and Greinke in game one and two is scary enough and the bullpen has been lights out. As far as their weakness I do believe it’s their health. Dodgers for some reason have this issue with staying healthy and that tend to hurt them a lot. Right now L.A. have Matt Kemp out for the season with a ankle injury and the status of Andre Ethier is really up in the air right now. This team must stay healthy in order to really make an impact. I do believe the Dodgers can go far. It’s going to be difficult because they have a lot of good teams to pan up against and will be on the road. I think the Dodgers can make it to the World Series due to their pitching and talent. Kristen says: I think pitching is the Dodgers biggest strength and an on again, off again offense is potentially their biggest liability. They sure aren’t hitting right now but even the last few games leading up to the postseason aren’t always an indication of play come October. If the Dodgers start hitting again, they could go pretty far. What, if anything, do you think the season fallout will be in the Angels organization? Is there anything this team can do to get back on track for 2014? Kristen says: I feel like Sadusky in National Treasure, “Someone’s got to go to prison, Ben.” I don’t know or even really want to predict who is going to leave but it’s certain that someone, and probably several someones, will. There are rumors flying far and wide about Jerry Dipoto and Mike Scioscia. On the one hand, if you take injuries out of the equation, Jerry Dipoto is responsible for the pitching situation – he dismantled the old starting rotation to build this one. One the other hand, Scioscia has managed four teams that failed to make the post season in a row, two of them with losing records…and don’t think we haven’t noticed that this is the first season Arte Moreno has failed to respond to questions over Sosh’s future with with instant unwavering support. So is it one or both of these guys or will it be a massive player shift? Or, D, some of all of the above? Personally, I’d like the fallout to be enough player movement to get an actual starting rotation going into 2014 without throwing all babies out with the bathwater to accomplish it. But I learned a long time again that I don’t think like a team owner, especially not this team owner, so I doubt it will be that. Matt says: I don’t think much will happen in the Angels Organization really but ig I had to pick I do believe the Angels will let go Jerry Dipoto. He has made splash signings with Albert Puljos, CJ Wilson, and Josh Hamilton but really nothing much has come out of it. He also failed to get the Angels true help which was to upgrade the pitching staff. I do believe that there is something that this team can do to turn it around in 2014 and that’s to get pitching help. They have the offensive firepower and enough of it but now is the time to really lock down on pitching if they want to make an impact in the AL West. After winning the NL West the Dodgers came out of their clubhouse and celebrated in the Diamondbacks pool in the outfield. This was controversial and commentators have expressed differing opinions on the matter. What is your take on the celebration? Matt says: Well I maybe in the majority that actaully don’t have an issue with this. I honestly think the Diamondbacks and media are making a huge deal out of it than we are or the Dodgers. If anything it started with them saying that the Dodgers couldn’t comeback out to celebrate which puzzles me. It was all done when everyone was out of the stadium and Los Angeles didn’t mean any harm over it at all. I understand the sportsmanship and classiness of celebrating but lets not forget when the Dbacks clinched they went swiming in their pool in 2011. It’s really no issue at all really and I think it’s bigger deal to Arizona than anyone else. Kristen says: On the one hand, I think the DBacks telling the Dodgers not to come back out of the Clubhouse to celebrate on their field was out of line and contrary to baseball tradition. So, if the Dodgers had just come out of the Clubhouse and celebrated on the field, I wouldn’t have any objections. But come on Dodgers, you can’t tell me that a large part of your motivation to celebrate specifically by jumping in the DBacks’ pool wasn’t sticking it to a division rival with whom you have bad blood and have brawled this season, knowing that such an action would really piss them off. While that is certainly an understandable, human motivation it isn’t exactly a classy one. So, do I think the Dodgers are evil? No. But they sure aren’t winning any kudos for sportsmanship this season. Of course, did they actually set out to? Probably not. So, baseball fan boys and girls, what does the 2013 season have to teach us about pre-season media hype? Kristen says: Well, both the Dodgers and the Angels were heavily hyped to go all the way. The Angels…yeah, ‘nuff said. *sigh* While the Dodgers have made it to the post season in style for sure…but with significant help from guys who weren’t even on the team when the predictions were made. Look, an MLB season is too long and complicated to ever listen to the preseason predictions with anything more than the kind of interest a diehard baseball fan shows any MLB news when there are no live games on yet and a ‘that’s nice’. Matt says: I think it taught us something very valuable. Baseball isn’t played on paper. If you were to tell me the Giants, Angels, Nationals and Blue Jays wouldn’t even come close to playoff contention then I would think you’re crazy. This season basically showed us a lot when it comes to pre-season media hype. The Dodgers and Angels got off to bad starts but the Dodgers managed to get it together in the second half of the season and the Angels struggled which was disapointing to see. I think we will all be more careful when we take a look at things in the pre-season but this was another example of how anything can happen in baseball. Get to Know Your Bloggers Bonus Question: Do you have any favorite memories and moments from the MLB Postseason? Matt says: Well I do have a few memories and moments from the MLB Postseason. The Dodgers sweeping the Cardnials in 2009 is one that sticksout because St Louis was a heavy favorite and it really shocked a lot of us when the Dodgers swept them out of the playoffs. Another was the Cardinals/Rangers World Series. It was sad to see Texas lose it when they had two chances at winning it but amazing to see the Cards win it thanks to David Freese heroics but I think my favorite has to be the Red Sox and Yankees 2004 Series where the Yankees were up 3-0 in the series and was bound to win the series only for the Sox to pulloff an amazing comeback to win the ALCS which was crazy to see. I hope to see some this postseason as well that we can talk about for years to come. Kristen says: You all know what I’m going to say here, right? ‘Erstad says he’s got it. Erstad makes the catch!’…except, favorite memory though that was, I wasn’t strictly back to being a baseball fan in 2002. I was a bitter, bitter lady over the strike, and I’d been raised a Dodgers fan, after all. No, I wouldn’t come back to baseball until I fell head over heels in love with the Angels about three seasons after the 2002 series. Sad, but true. But I do remember when they won. My grandfather was a lifelong Angels fan going back to the Minor League PCL days, but he passed away in 1990 and missed the team’s truly good years. It’s maudlin, but I remember catching the end of game 7 on TV and wishing that somehow he knew, as you do. Now, with my odd mixed fan base baseball background, I also have vivid warm fuzzies over 1988, and that first Saturday game, building the Lego castle of the weekend all along the den floor with my sister while we watched the World Series. Memories of Vin Scully’s, ‘And look who’s coming up…’ and just knowing who I was going to see when I put down the Legos and looked up at the screen, because Kirk Gibson was my hero, so of course he would come in at just the right moment to win the game like it was some sort of fairy tale. Ah childhood! But I guess that’s part of why I really get into doing this whole I-5 Bias thing, even when my team blows so many goats for the season that they actually made me momentarily happy the regular season has ended. Oh well, here’s looking forward to 2014 and hopefully less drama and more editions of I-5 Bias where I get to brag about my guys. Cheers!